Hand-rolled, Mama’s style meatballs is the calling card for twins Livio and Lorenzo Belpassi, who have just opened their first restaurant in what is becoming south London’s answer to hipster Hackney. Based a stone’s throw from Tooting Broadway station, the 40-seater restaurant caters to a loyal customer base. The brothers originally started off serving Italian meatballs in pop-ups around London. They then bought a vintage Fiat and set up a food truck in Old Spitalfields Market in 2015. Having a permanent bricks-and-mortar restaurant was a natural progression, and focusing on the simple concept of meatballs and homemade sauces allowed them to carve their own niche. Wood floors, exposed bricks, and cutlery in large old tins of tomatoes sitting on the tables—together with glass bottles of house water—gives the restaurant a homely air. The paper menu is small but has more than enough to excite diners. A selection of 'salumi' (cold cuts), 'cicchetti' (small snacks), and salads are offered to whet our appetite before the mains. Whilst all of the above sounded utterly tempting, we wanted to save room to try multiple combinations of the meatballs themselves. There are five options of meatballs—beef & pork mix, Irish beef, cherry orchard pork, lamb and veggie, and three options for bases—rigatoni, chilli greens and polenta and sauces—amatriciana, san marzano tomato, basil and pesto. Among the beef and pork mix with a rigatoni base and san marzano tomato basil sauce, cherry orchard pork with polenta and san marzano sauce, and the lamb with chilli greens and amatriciana, the latter stood out. The spice from the sauce did not overpower either the lamb or the chilli greens, instead forming an irresistible trio on ours plate that did happy dances in our mouths. Four meatballs per plate were all of good size (think golf balls), moist, and held together well. All the bases and sauces otherwise complemented the meatballs. Sides of zucchini fritti and rosemary garlic fries were both good to dunk in the remaining sauce, although the zucchini fritti could have been a little less chunky. For those still hungry, there’s a choice of ‘formaggi’ (cheeses) and then ‘dolce’ (dessert). The latter are simple and on point: tiramisu or gelato. This further defines the brothers’ attention to good ol’ Italian comfort food. The chocolate gelato tickled our fancy better; it turned out to be from award-winning Oddono’s in Clapham. The brother’s mantra “we make meatballs, we cook them, you eat them” should perhaps add another phrase toward the end: “and you leave happy”. 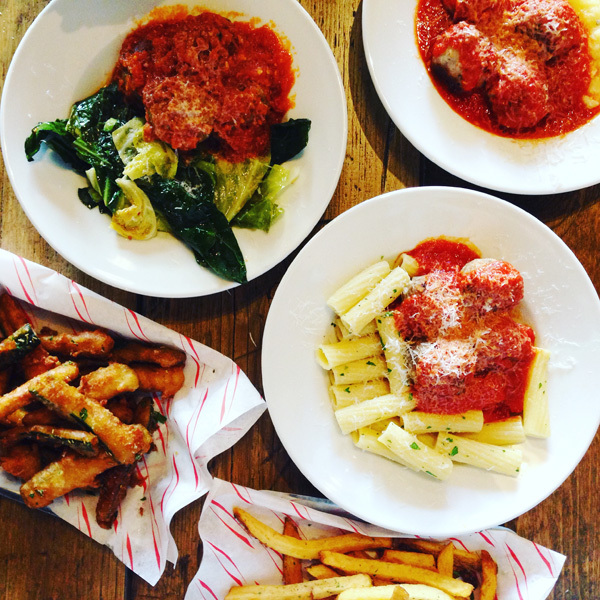 Italian dining is often all about comfort food and pleasure, and the brothers have this down to a tee. They’re a good example of how a simple concept, done well, is a winner. Belpassi Bros is still in its early days, but our hunch is that Tooting has lucked out yet again. Opening hours: 17:00-23:00 Mon-Sat; 17:00-22:00 Sun.